The pound remains volatile amid Brexit jitters. After forming a bottom around 1.237 area, it is sharply higher as the Theresa survived the no-confidence vote, despite the defeat of her Brexit deal with the EU. The rejection of the agreement has sharply increased the possibility of a better agreement with the EU. In recent weeks, the warning rhetoric from the Bank of England (BoE), continued tensions between the European Union and the UK over Brexit trade agreement, and weaker than expected economic dockets have pushed the pound lower against the dollar but quickly recovered as positive Brexit news hit the market. However, weaker than expected numbers from the UK real estate sector, as well as manufacturing pose concerns. 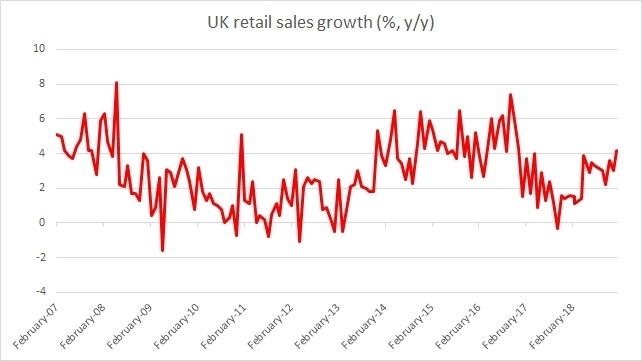 The focus for today is on UK retail sales, which has been relatively stronger. The report will be released at 9:30 GMT. As said, this report would be vital in supporting the sterling. If the sales remain strong it would be an indication that people are willing to spend money, despite the uncertainties surrounding Brexit. However, it has shown weakness in 2018. After the crisis of 2008/09, the retail sales started to recover and the growth rate reached a level much higher than it was before the crisis. In August 2016, retail sales growth reached 6.6 percent. Compared to that, September was weaker with 4.1 percent y/y growth. In October, retail sales hit the highest level of growth for the year 2016 to 7.4 percent. UK retail sales are expected to grow by 3.3 percent y/y in February but decline by 0.4 percent on a monthly basis. Weaker than expected report would lead to a further selloff in the pound. However, the current short-term bias remains to the upside thanks to the dollar’s weakness. The pound is currently trading at 1.321 against the USD.